The husband grew up eating halwa for breakfast, snacks and even for his lunch box many times. His mother never had enough time but preferred to cook nourishing meals with minimal efforts for the two brothers and they grew up eating a limited variety but delicious food nonetheless. Even now the husband demands either atte ka halwa or besan ka halwa sometimes when he comes back from office. Being quite easy to make I just cook halwa while the chai boils on the stove. Both of us are a contrast when it comes to taste. While I always have something savory with my tea but the halwa is just right for him after the day's work. It gets repeated often and I even have started appreciating halwa more now.. This besan ka halwa I made in a new cast iron kadhai as the tradition is to make a sweet halwa when cooking in a kadhai for the first time. As I said the recipe is easy and though I go by instinctive measurements, I am writing down the quantity by cup measures. Heat 1/2 a cup of desi ghee into the kadhai and tip in 1 tbsp of rawa or suji into it and then quickly tip in 1/2 cup of besan. Now if the besan is coarse, no need to add suji, but fine besan needs some suji to make the texture more enjoyable, the suji besan ratio may be variable though. Keep stirring the flours on low to medium flame till deep pink in color and aromatic with a well roasted smell. I normally don't use cardamom powder, but it can be used, 1/2 tsp if desired. I like the besan aroma to dominate so don't add any other flavor. When the besan is nice and brown, add some chopped nuts of your choice and keep stirring till the nuts are roasted too, taking care not to burn them. Add 1/3 cup of sugar (a little more if you like it more sugary) mix, and pour 1/4 cup of water. Take care to pour the water in a thin stream and keep stirring the mixture with the other hand, till a crumbly soft ball is formed. Keep stirring for a few more minutes if you like thin pieces of crust into it. Yes if you keep bhunoeing it more and don't urn that often, small crusty bits of halwa get caramelized and some people really love them. Cooking it more after adding water allows crust formation which is liked by some people as I mentioned, and that's it. Serve hot, no garnish needed. 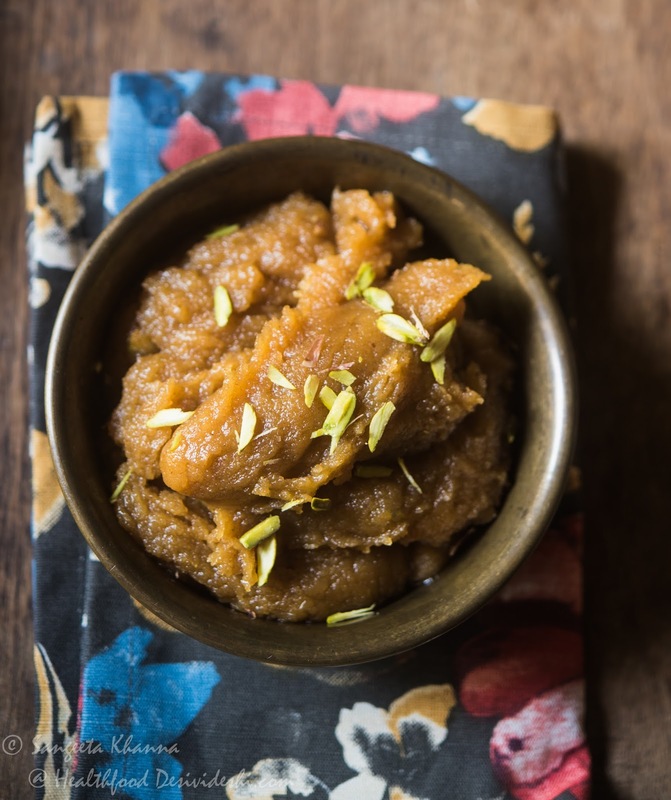 the besan ka halwa can be made a little softer too by adding a little more water if you like. 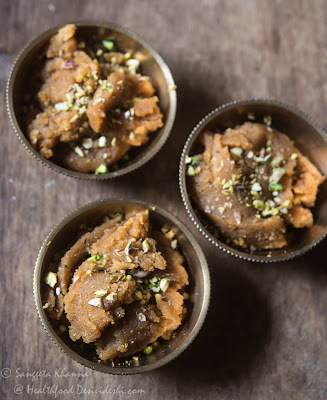 I like the softer version more so sometimes make besan ka halwa like this. I suggest to keep the portions small as it is heavy on the digestion as well as calories, keeps well in the fridge for a week...just microwave and serve hot again. 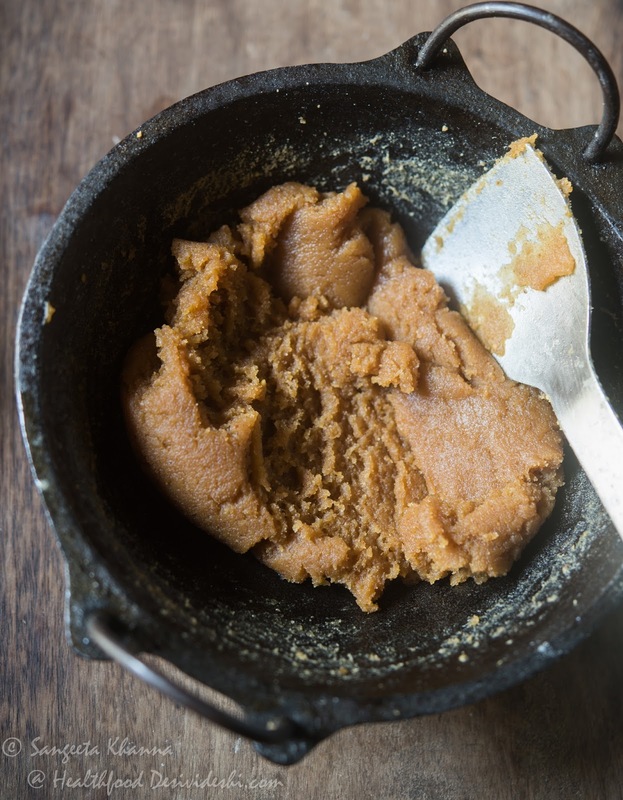 Nuts can be added if required, but besan ka halwa is great as it is. I made this halwa today. It was too oily and too sweet with the measurements you provided. Are you sure it is 1/2 cup besan and not 1 cup besan. I think the given measurements look more appropriate with 1 cup besan. However, barring the more than desired sweetness, the halwa was heavenly! I love your blog. 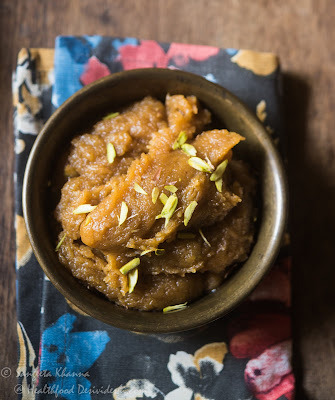 Hi Poonam .... i know this recipe makes a very sweet halwa dripping with ghee . It is made this way traditionally and besan halwa is considered the richest in Uttar Pradesh . You can always adjust the ghee and sugar to your taste , i myself make it with 1 cup or even more besan for the same amount of ghee n sugar , but my husband and many other halwa loving people like it this way . Thanks Sangeeta.... I am from Banaras as well and my hubby loves Banaras ka khahna ... especiall Fara and Gujia, Littli Choka etc.. Thanks for creating this BLOG!